An unusually serious, in-depth study book for a disciple of champagne… all the elements that come together to make up champagne, from the vineyards to the winemaking to the structure of the industry. The guided tastings are instructive, …champagnes incredibly carefully chosen for their properties and characteristics. Learn about champagne through the prism of tasting. The ability to write a study book that isn’t dry and ponderous is a real gift. I am not criticising the price. It’s worth it. A detailed introduction to the region and its wines through guided tasting…. Enthusiasm bubbles throughout the text and is infectious… The book’s final chapters, on different aspects of Champagne, are engaging and informative by any standard. Contributing editor, tasting panel member and columnist, Gourmet Traveller WINE. … an encyclopaedic book loaded with information and defying categorisation. It’s an engrossing and comprehensive book, which took years to research and write. The quality of the production is high, and it’s a beautiful book to regard. Perhaps a hardback rather than soft would have been justified (but no doubt the price would be even higher). I recommend it. Thank you. I keep reading your book, so informative and educational, showing a deep knowledge and understanding of the Terroirs of Champagne, a so- needed update on old and new cuvées! A great approach to the different styles of Champagne as well…..As we say in England CHEERS Lady Kaaren Palmer! This is a must read book for all Champagne Lovers! This labor of love took years of work, and transmits the passion and experience of the author. Warning : it will make you quite thirsty for more bubbly. Champagne…a tasting journey was the recipient of the Gourmand World Cookbook Awards ‘Best French Wine Book’ 2016. A welcome addition to the field, and is as entertaining as it is informative and educational. I certainly commend her new book “Champagne: a tasting journey” to all who have any curiosity or interest in the wide variety of wines of this classic premium region. N.B. Cam O’Keefe in fact won the Professional Section of the Vin de Champagne Awards, Australia, in 2016. Long awaited, Kaaren Palmer’s erudite tome is bound to become a best seller. CHAMPAGNE…A TASTING JOURNEY is not just a comprehensive introduction to the world of champagne, but importantly, it is a step-by-step guide to tasting and appraising champagne. Palmer’s book is the first book of its type about champagne and undoubtedly will be translated into many languages as it becomes well known. A text book in many ways, but without any of the austerity or incomprehensible language one often finds in such books. Advanced, professional or beginning on your champagne journey, this book allows you to select your level of interest of the moment and grow your knowledge over many tastings. Adoration of champagne encompasses the entire world and the thirst to know and understand more about this precious drop has universal appeal. Palmer’s book will become the definitive source for anyone wanting to learn more about champagne. Your champagne book is wonderful. I love that you give such specific instructions on tasting. I am now forming a New Orleans champagne group. 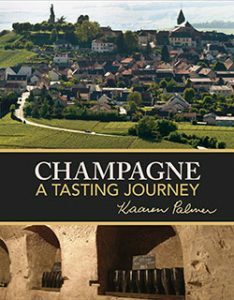 Have been reading Kaaren Palmer’s recently released book ‘Champagne A Tasting Journey’, which I would recommend to anyone with an interest in champagne. A great read – and very informative.